As the demographic shift to an older population continues, a growing number of men and women will be diagnosed with osteoporosis and a search for potential non-pharmacological alternative therapies is increasing. In addition to existing drug therapies, certain lifestyle and nutritional factors are known to reduce the risk of osteoporosis. The benefits of prune consumption for osteoporosis and their role in total body bone mineral density (BMD) loss have been supported by scientific research in both animal studies and clinical trials. Prunes are high in fiber, vitamin K, which contributes to the maintenance of normal bones, and potassium, which contributes to normal muscle function. Prunes are also a source of copper, which contributes to maintenance of normal connective tissues. Research in prunes has increased beginning with studies of their potential in restoring bone and preventing bone loss in animal models of osteoporosis. Some animal studies suggest that fruit consumption with antioxidant content may have a pronounced effect on bone health, as shown by higher bone mass, trabecular bone (a.k.a. spongy bone) volume, number and thickness, and lower trabecular separation (which puts the person at risk of osteoporosis) by enhancing bone formation, suppressing bone resorption and increasing bone strength. The bone protection effects seem to be mediated via antioxidant or anti-inflammatory pathways leading to osteoblast mineralization and osteoclast inactivation. According to a randomized controlled trial published last year, prune (dried plum) consumption may prevent the loss of total body BMD in older osteopenic postmenopausal women. Forty-eight osteopenic (bone mineral density is lower than normal but not low enough to be classified as osteoporosis) women (65-79 years old) were randomly assigned into one of three treatment groups for six months: 50 g of prunes, 100 g of prunes or a control group. All groups were supplemented with calcium and vitamin D. Total body, hip and lumbar bone mineral density were evaluated at baseline and six months after using DEXA. In addition, several markers of bone metabolism were determined during the trial. Data revealed that both prune groups were able to prevent the loss of total body bone mineral density when compared to the control group. This effect has been explained in part to the ability of prunes to inhibit bone reabsorption. 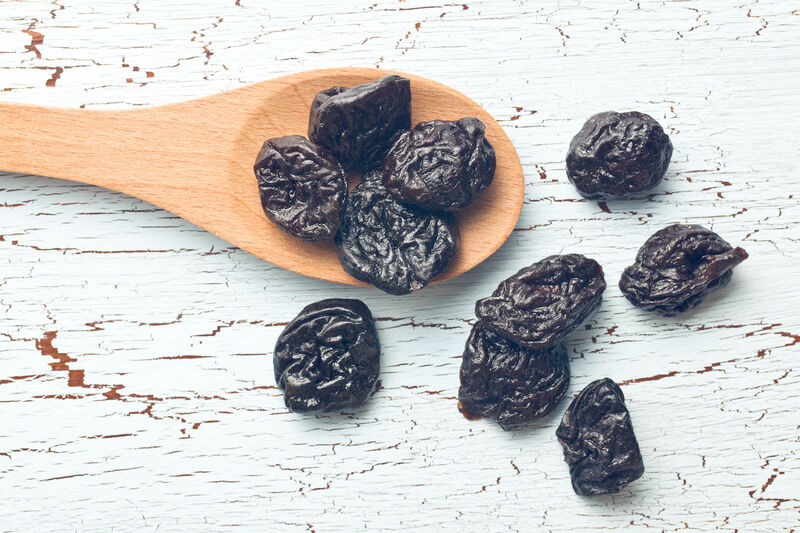 The study’s results support previous data on the role that prunes may play in bone health, especially in older postmenopausal women.